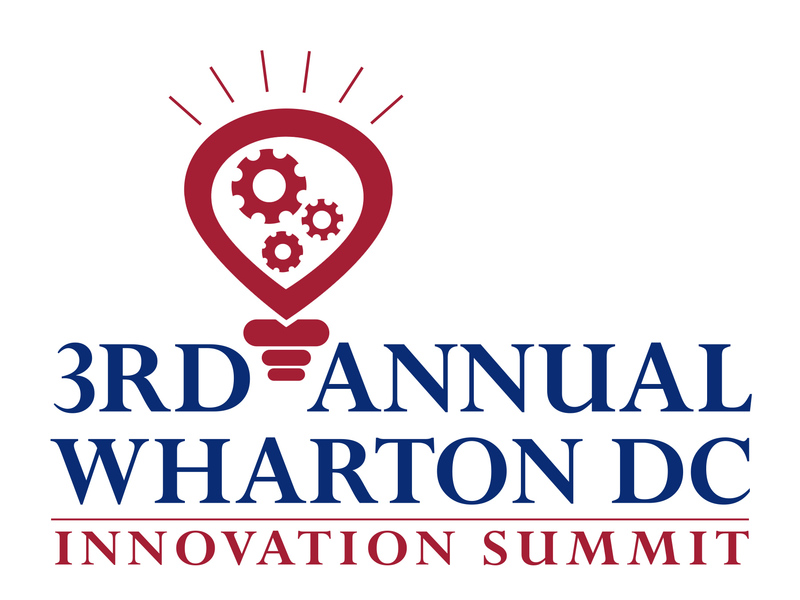 3RD ANNUAL WHARTON DC INNOVATION SUMMIT - REGISTER NOW! to one another and potential resources. knowledge, connections, inspiration and fun, as you move your career forward! each of which received rave reviews from speakers, attendees and sponsors. three will truly be "a charm" for those who join us! for YOU to ATTEND, PARTICIPATE IN, COLLABORATE, and BENEFIT from the Summit. Don't miss out - ACT NOW! Recommendation: to get the impact of that new website, view it on your laptop or desktop computer. These gave us a good start, and 2016 will be bigger and better! 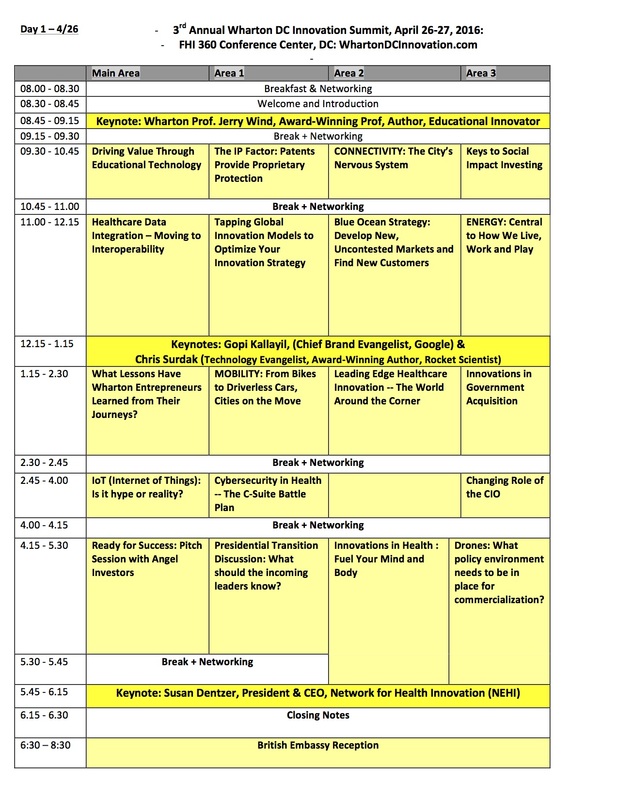 More information being posted on Main Summit website, WhartonDCInnovation.com, soon. To view the 40+ keynote and other sessions by topic, CLICK HERE! Feel free to contact us if you'd like to learn more about sponsorship opportunities by emailing us. Just click here . Wharton Club Members / Strategic Partner Member / FulliTime Govt, Nonprofit or Academia Only: (IF NOT WHARTON CLUB MEMBER, must list the name of your Strategic Partner / Govt. Agency / Nonprofit under Special Instructions when you register. Thank you! ONE-DAY RATES are for either April 26 or April 27 ONLY - you must specifiy which day you plan to attend. Your pass won't be valid on the other day. But you will be able to attend and enjoy all sessions, networking, meals and the reception on that day. IMPORTANT NOTE: You do not need to be a Wharton alum to attend and get the full benefits of attending the Summit! 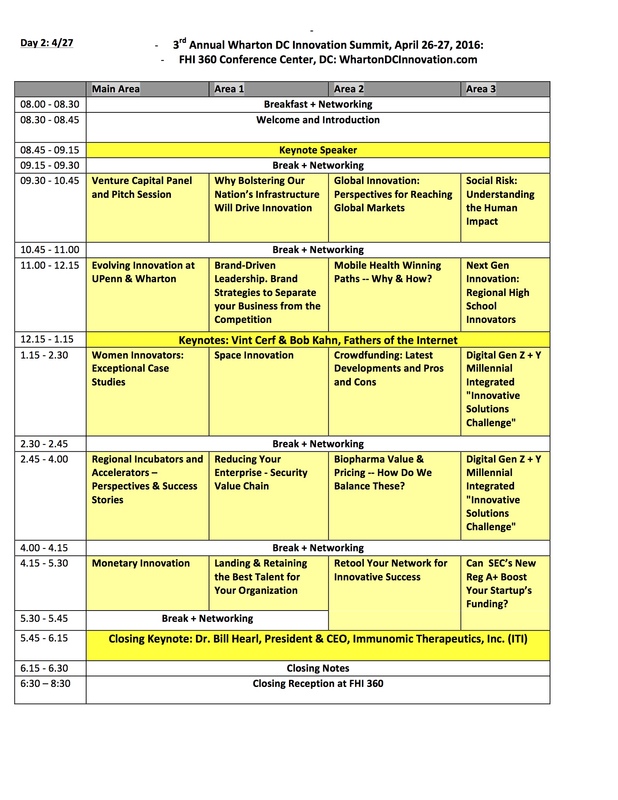 Everyone interested in "Raising Your - and Your Team's - Innovation IQ is invited - and encouraged - to attend.